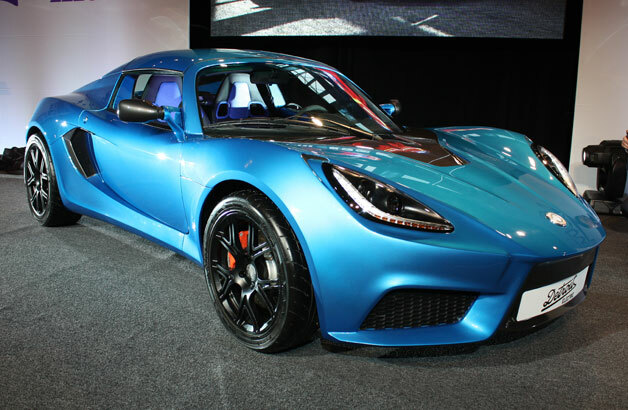 The delayed Detroit Electric SP:01 electric sports car is heading toward production, with a U.S. on-sale date set for early 2015, the company said on Friday. A new YouTube video provides a glimpse of the production-ready SP:01. The video provides "a hint of the final exterior design of the company's new vehicle," Detroit Electric said in a statement. Detroit Electric will relaunch its Web site in late October with updated information about the SP:01. The SP:01 is an open-topped two-seater built on a Lotus Elise platform. The car completed "successful prototype testing in June this year," Detroit Electric said. There is no confirmation yet of model-year designation or whether the estimated price still remains around $135,000. The startup automaker also said that all of the cars will be manufactured in a "new, dedicated Detroit Electric production facility in Leamington Spa, England." Earlier, the company scrapped plans to build its Detroit Electric SP:01 in Michigan and said it will manufacture the vehicle in the Netherlands. Detroit Electric provided no update on another new model (a sedan) that was to be engineered, developed and assembled in Detroit. The Detroit Electric brand was revived in 2008 by Albert Lam, former CEO of the Lotus Engineering Group and executive director of Lotus Cars of England.